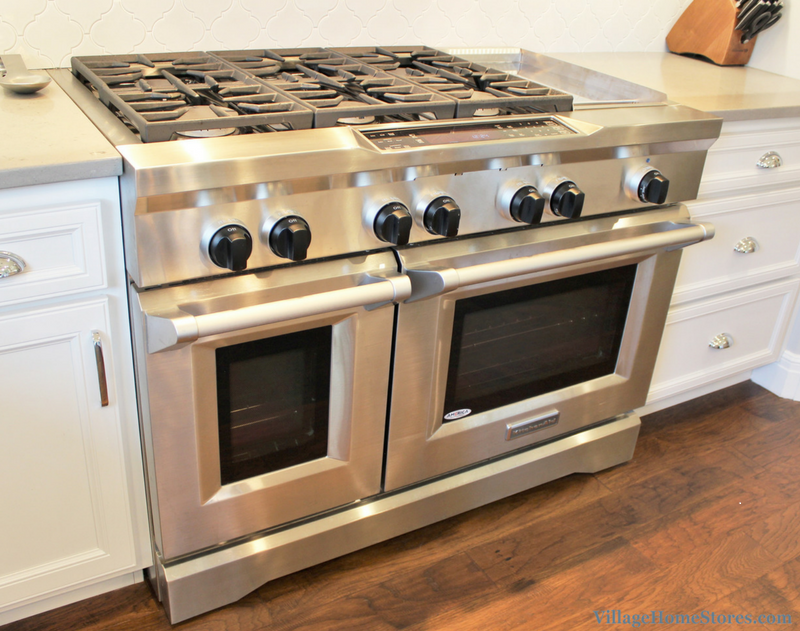 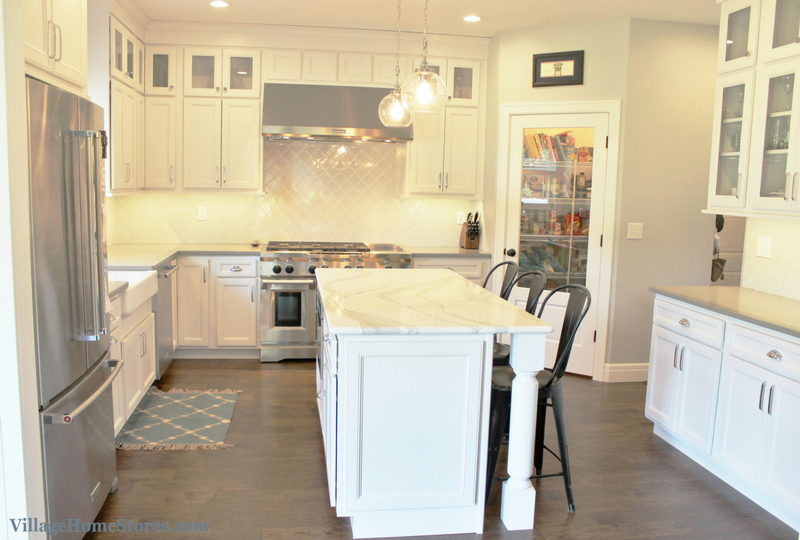 This kitchen in Moline, IL is classic in the permanent elements and fun and playful in the accents! 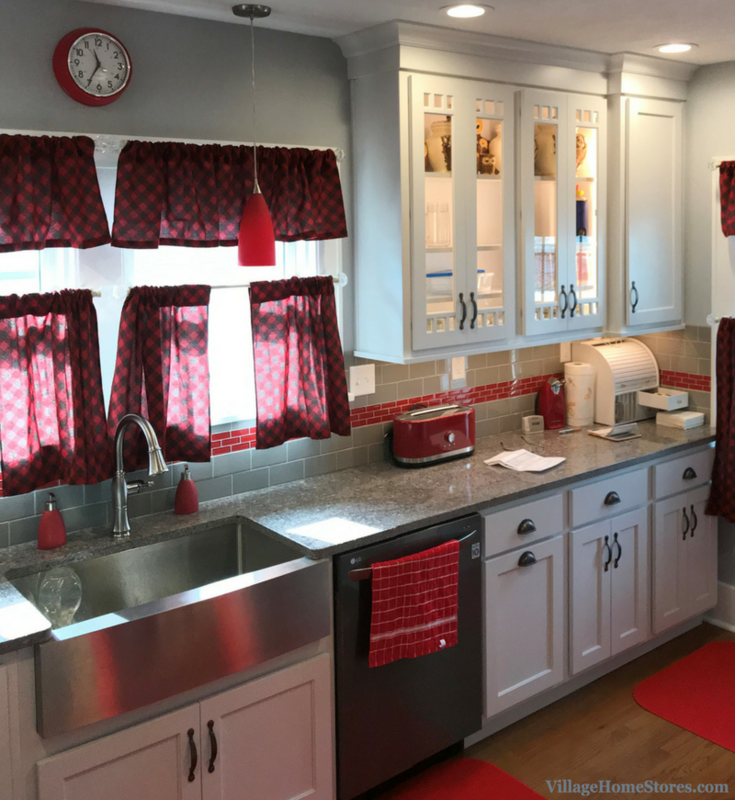 We love how this customer has accented this finished space with red! 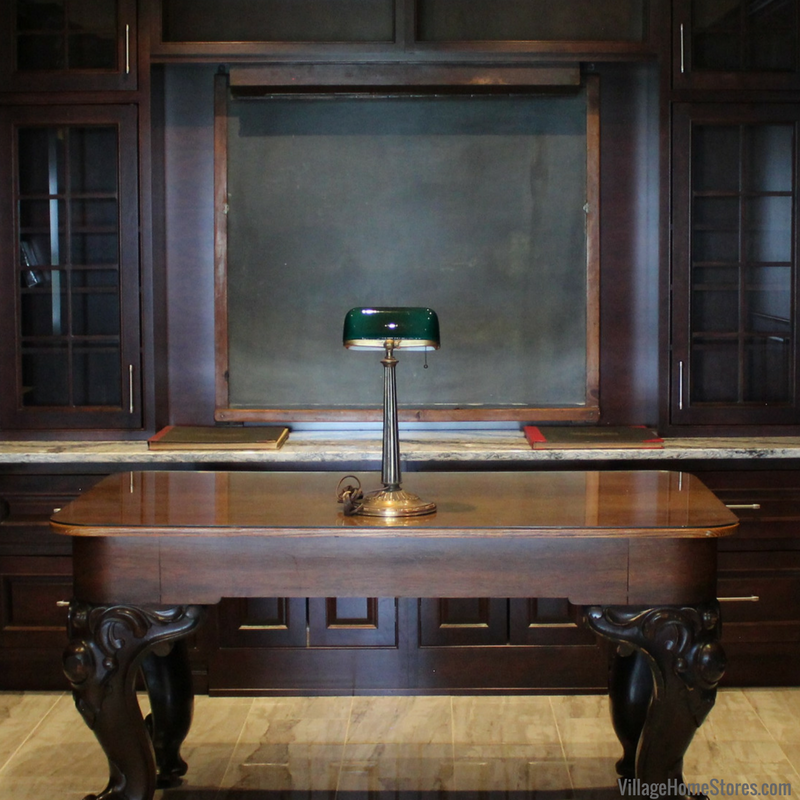 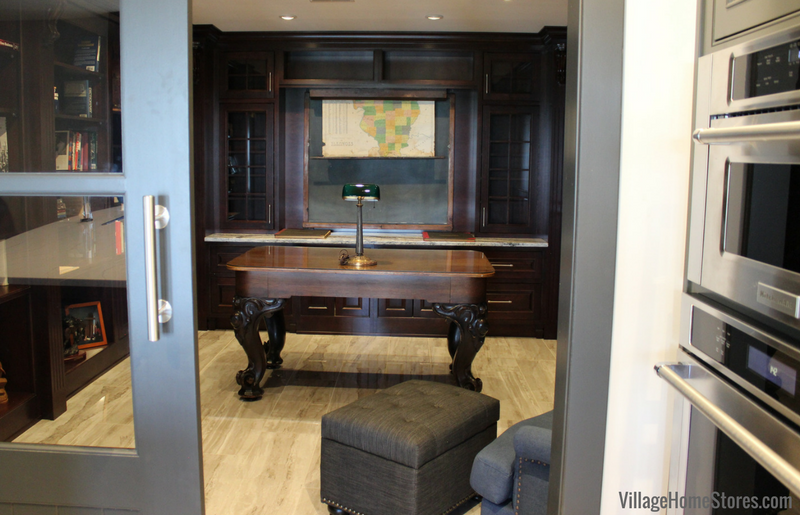 Let’s take a look around the newly remodeled space! 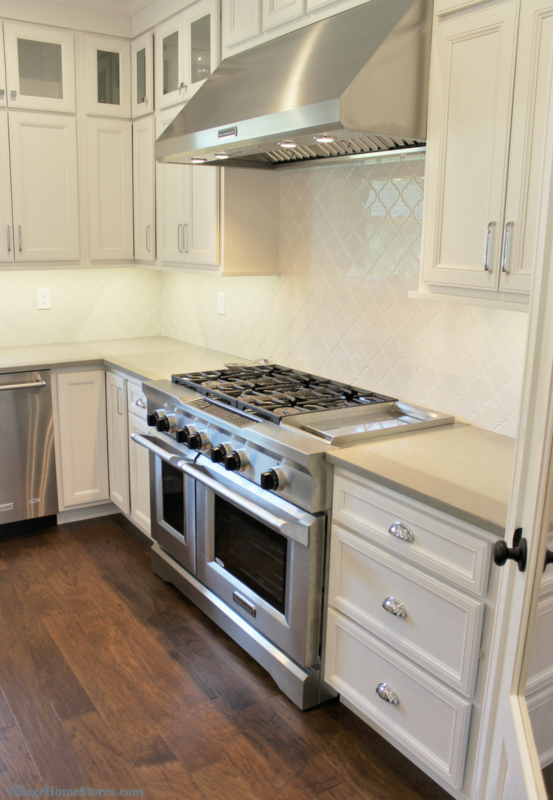 White painted cabinetry from our Koch Classic line is arranged in an L-shape layout with a built-in look for the refrigerator across from it. 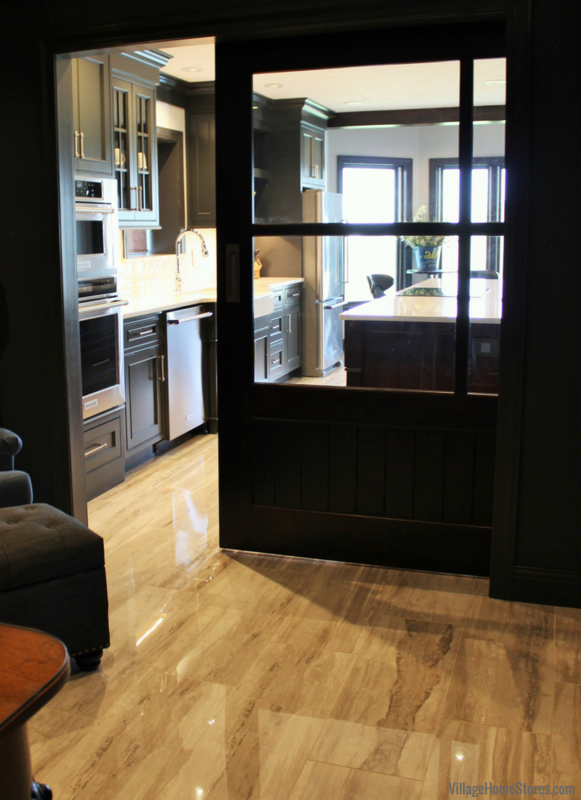 The flat-panel “Prairie” door style is a classic and Transitional choice. 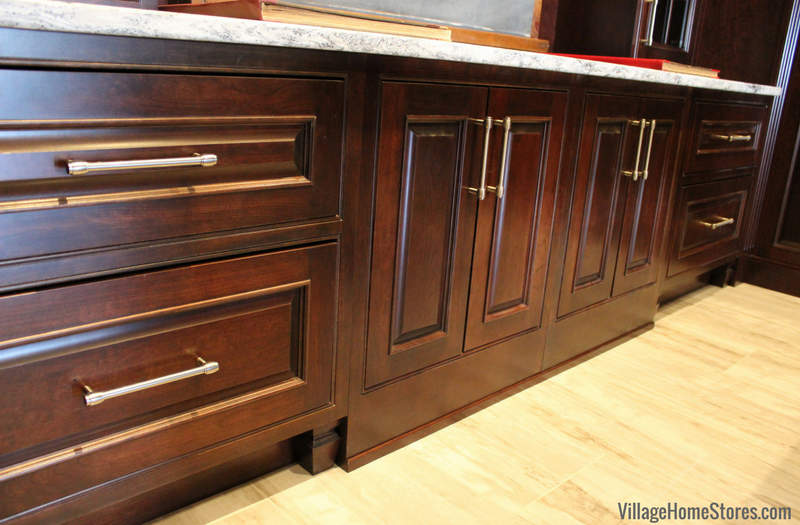 The drawers are a smooth, slab style perfect for the bin-pull hardware. 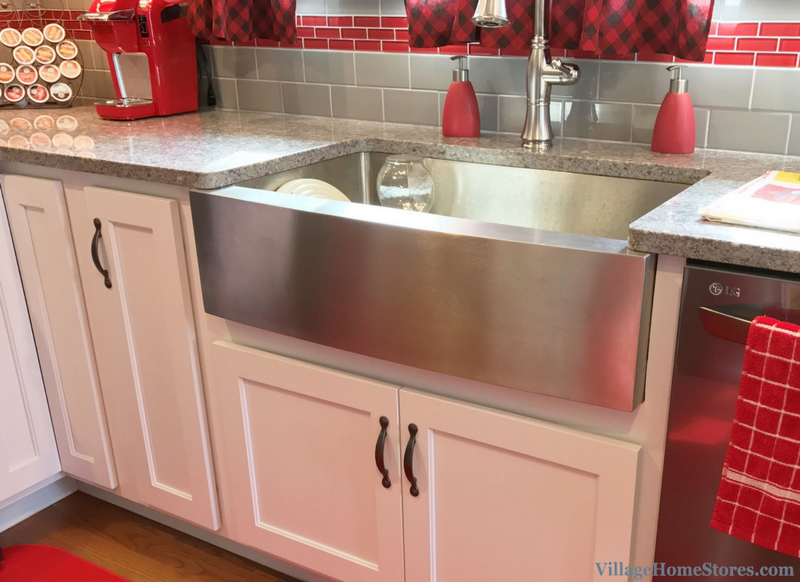 A modern twist on a classic concept is the use of a Stainless Steel farmhouse sink. 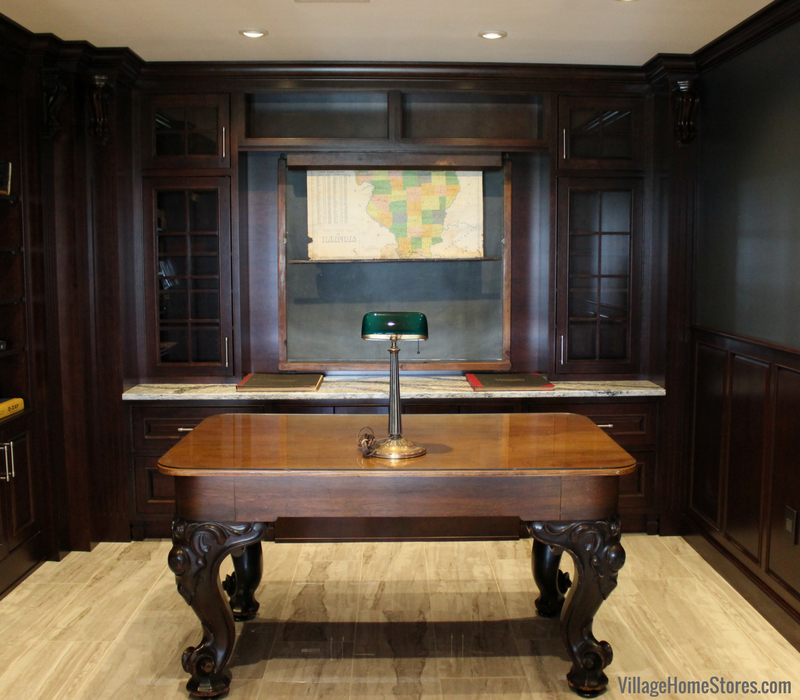 This single-well model is a sleek looking detail. 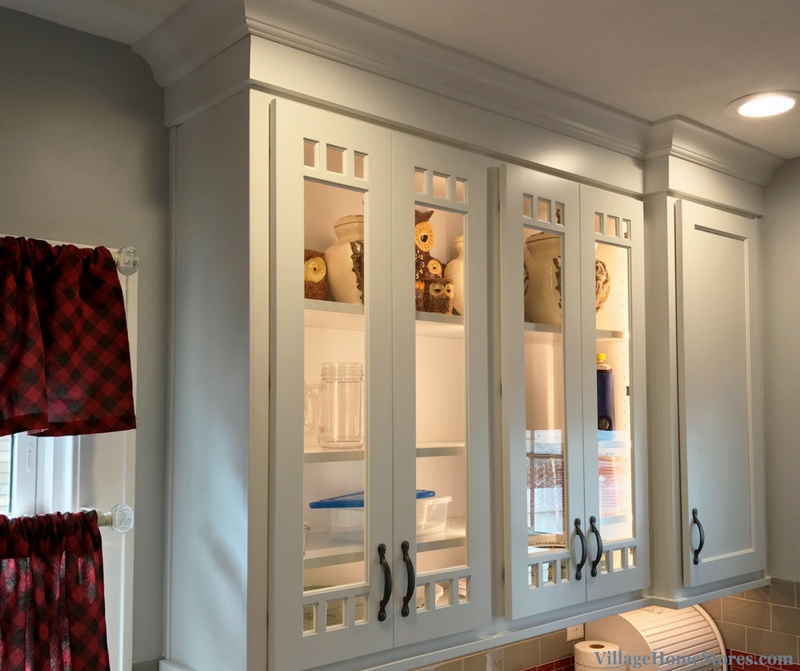 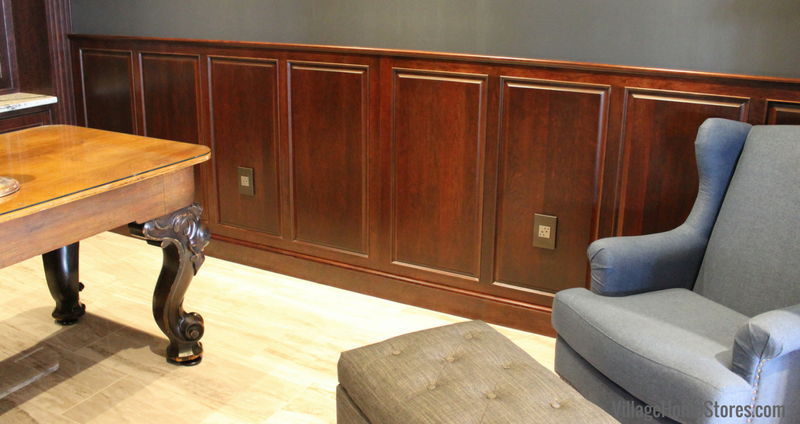 The new wall cabinets stretch all the way to the ceiling with a stacked crown molding application. 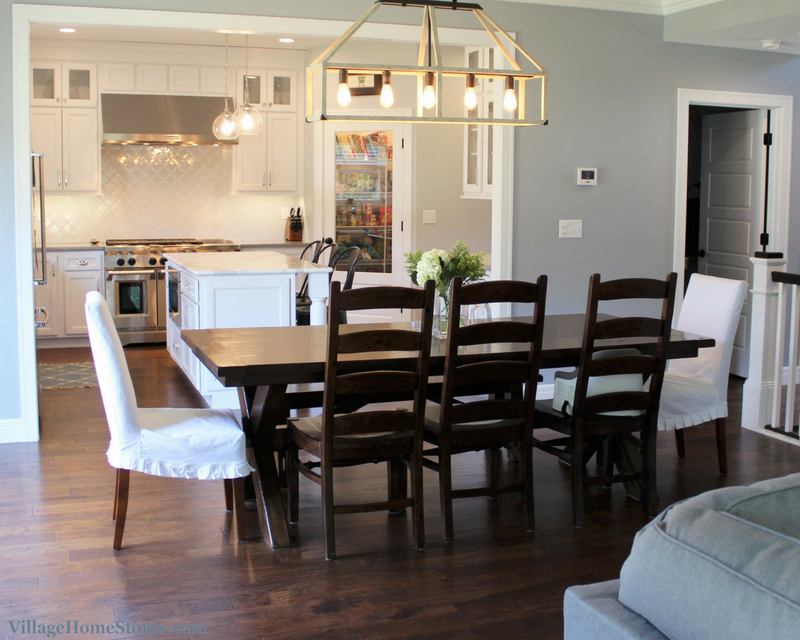 Stacking a crown molding atop a riser or valance allows a very forgiving application for your trim carpenter if the home is older and may have a varied ceiling height. 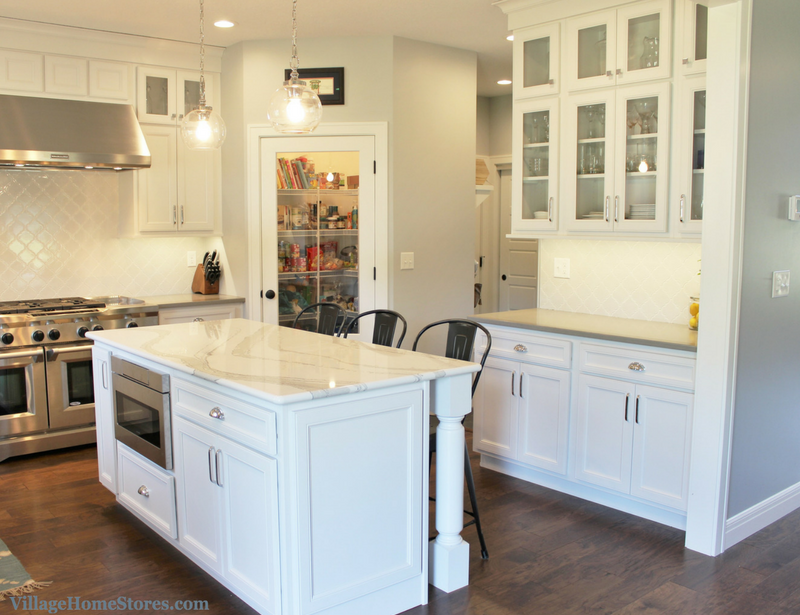 The range wall of cabinetry includes a corner susan cabinet and two angled cabinets to cap off the end. 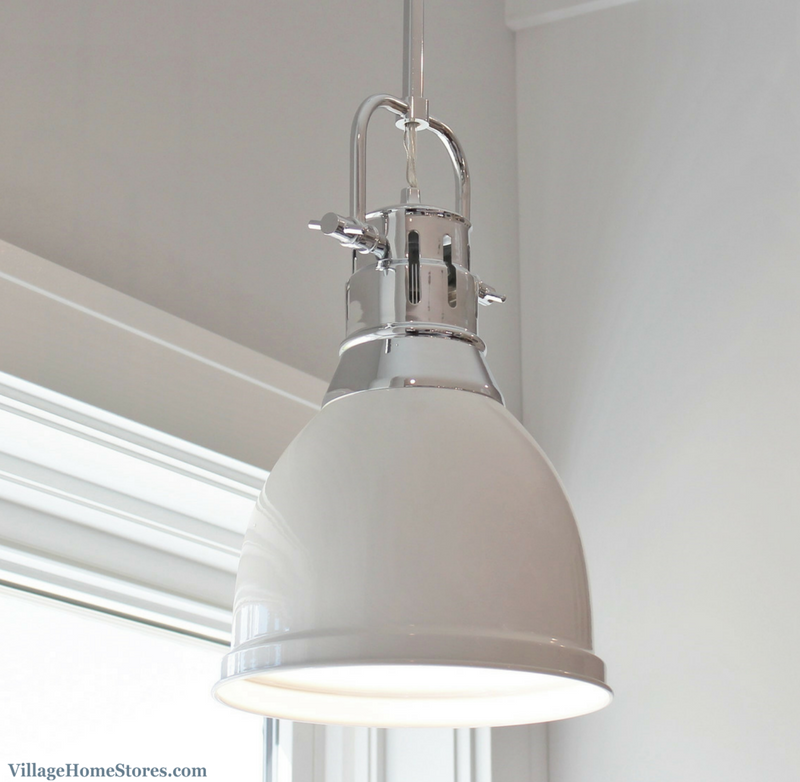 A wide window above the sink provides a lot of great light and plenty of space for two pendant lights. 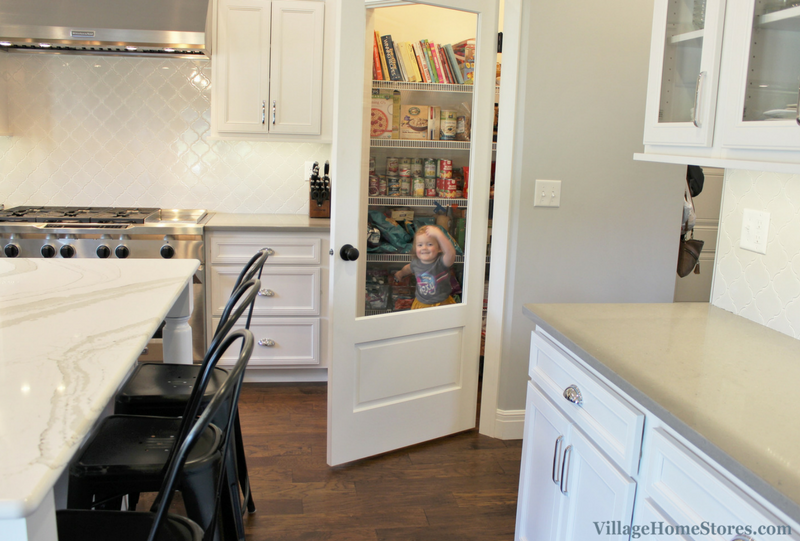 There are glass door cabinet included in the new kitchen. 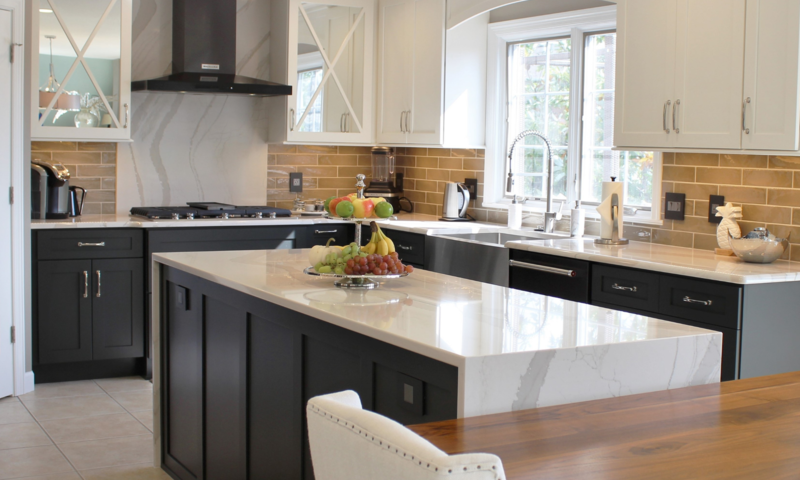 A white painted finished interior and clear glass inserts provide a great space for displaying items and help to give the kitchen even more of an open look. 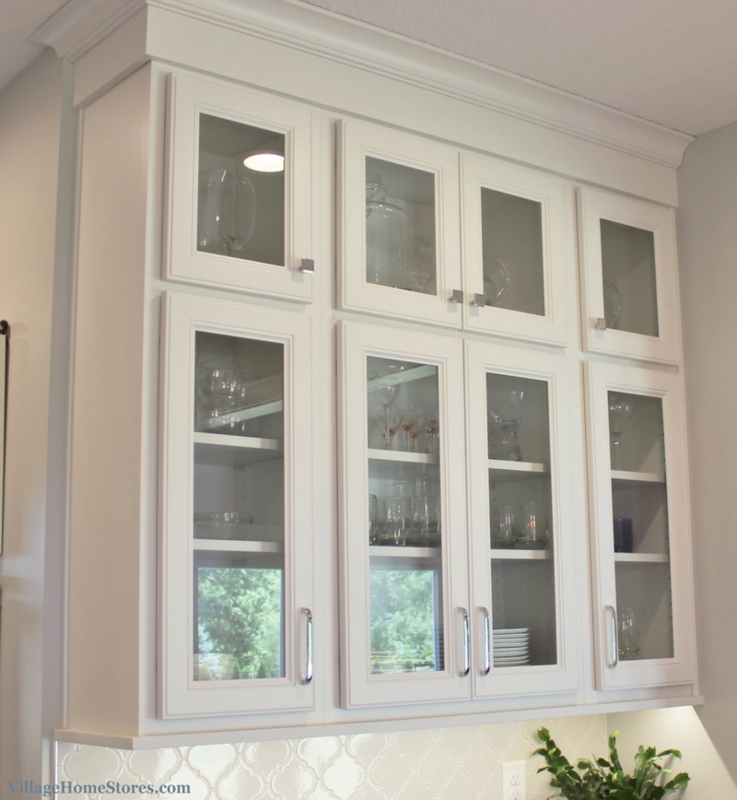 Don;t forget that our Diode LED undercabinet lighting system can be installed inside of a cabinet too. 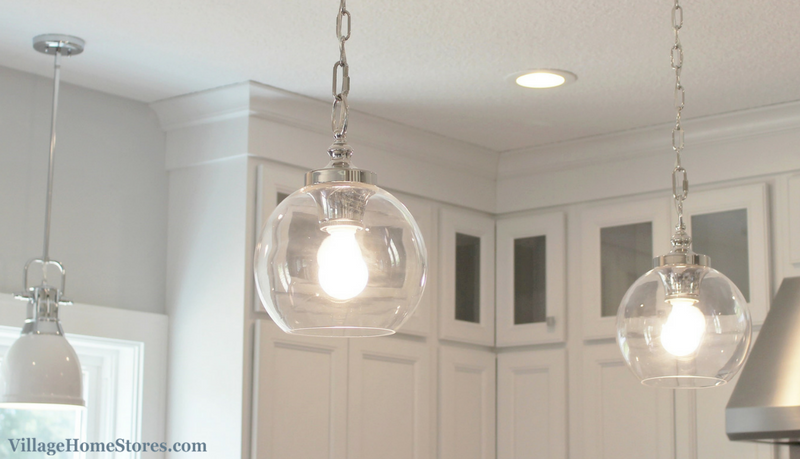 Lighting your glass-door cabinets help showcase you displayed items and the overall kitchen perfectly. 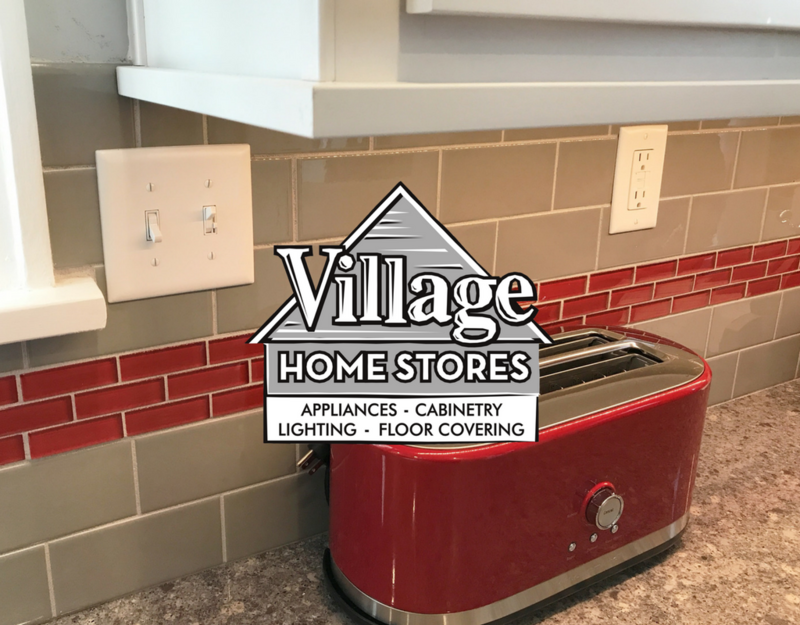 This Diode lighting is our best recommendation for any kitchen that has invested in a tiled backsplash. 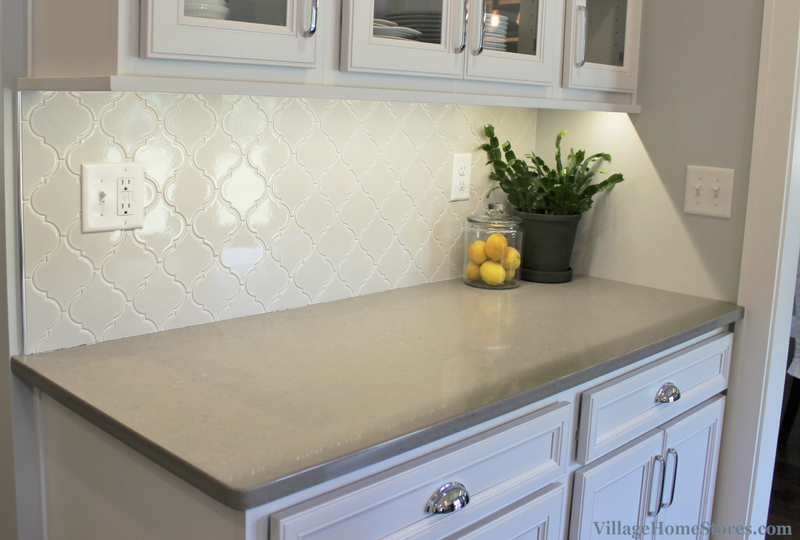 Why tile a surface if you can;t show it off? 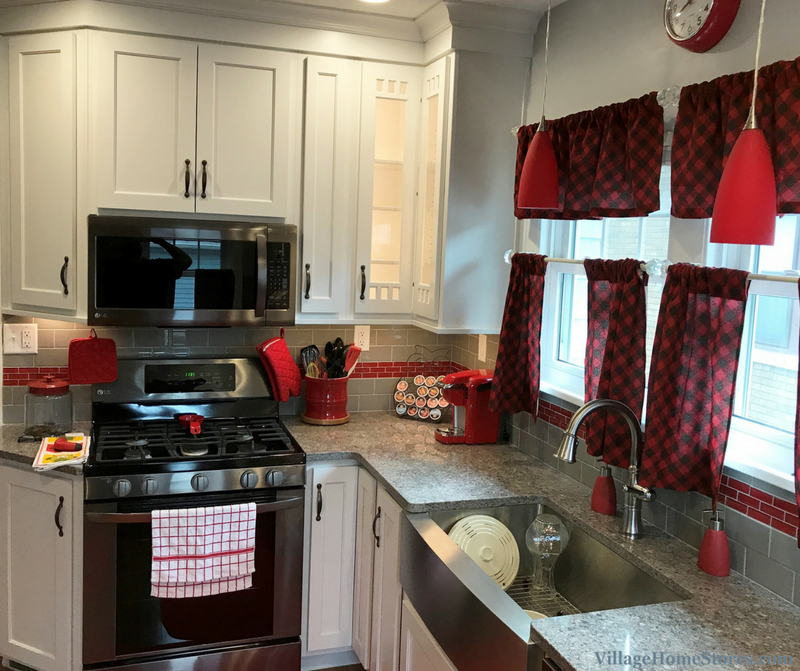 We love the glass subway tile here with a red accent strip. 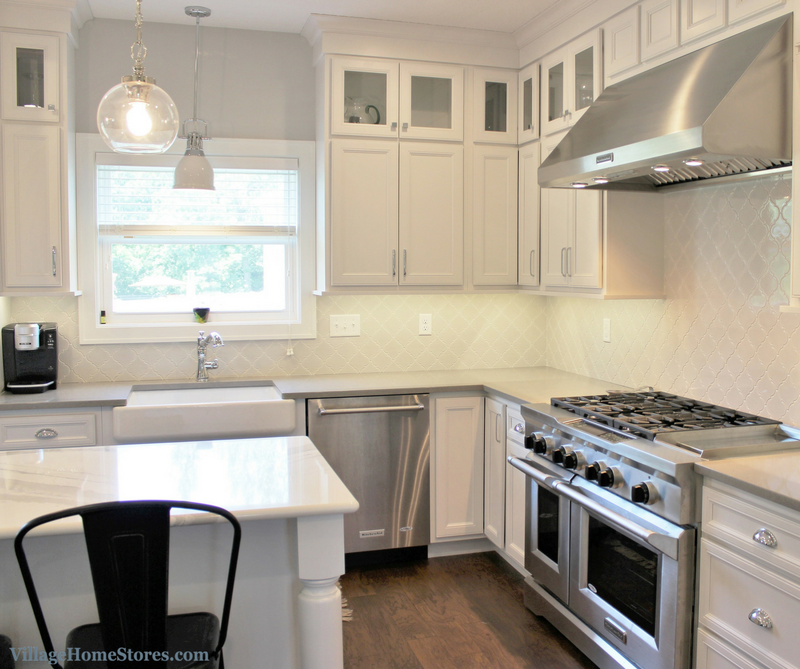 The main 3″ x 6″ subway tile is by Jeffrey Court in the “Haze” color. 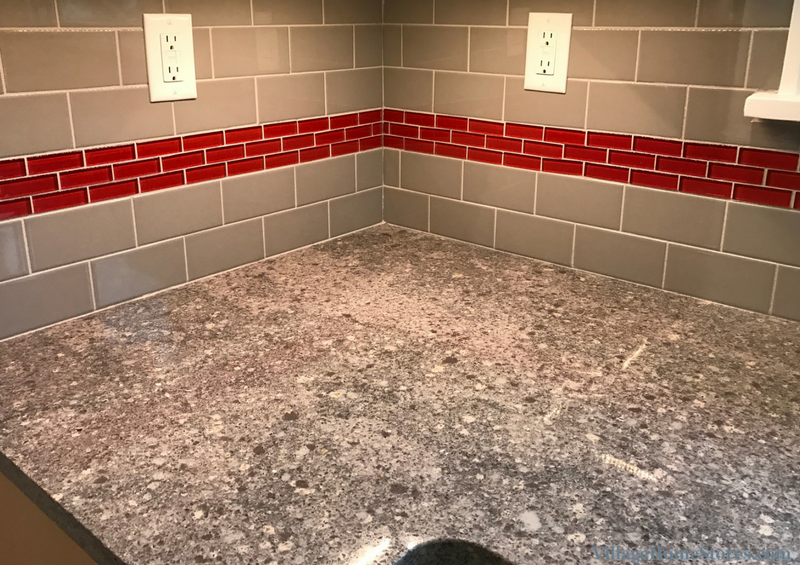 The red 1″ x 3″ accent tile is from the “Crystile” series by Glazzio in the “Ruby Red” color. 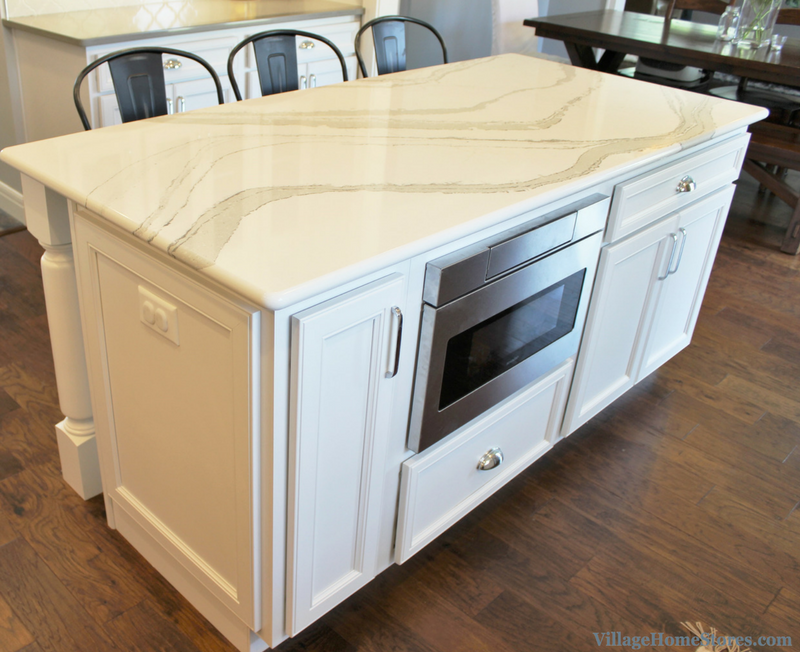 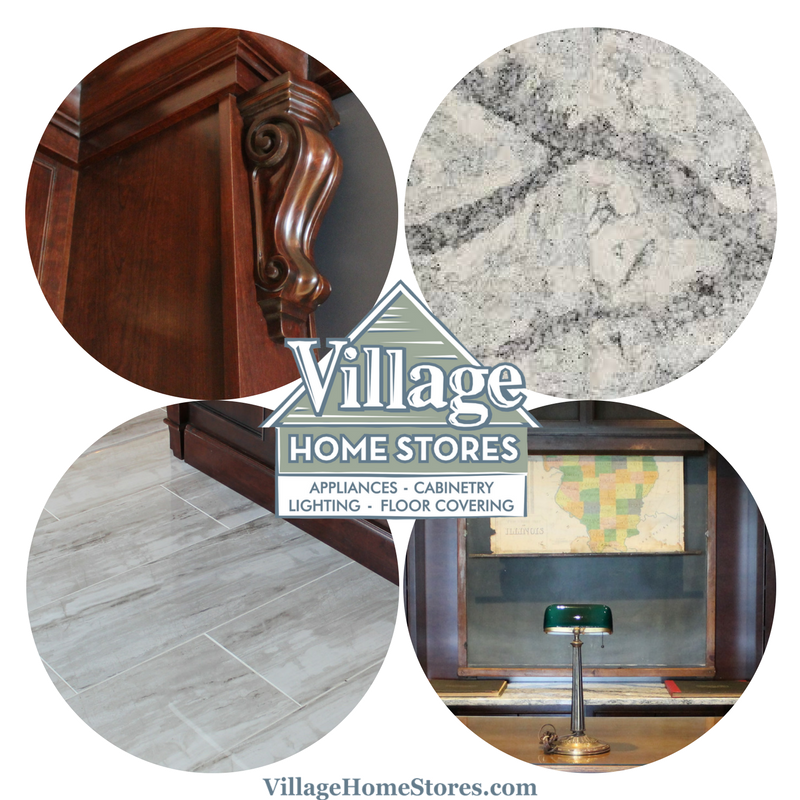 The engineered quartz counters are from our Hanstone Quartz line. 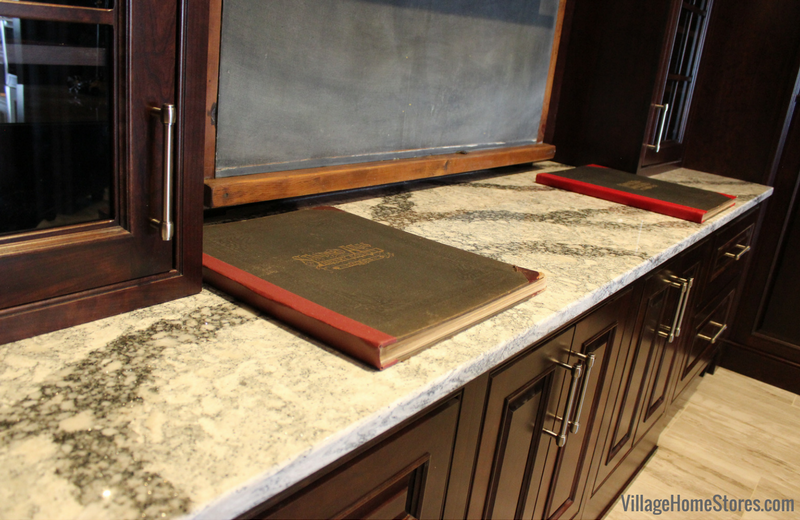 The color is named “Concord” and the standard “Eased” edge profile has been applied. 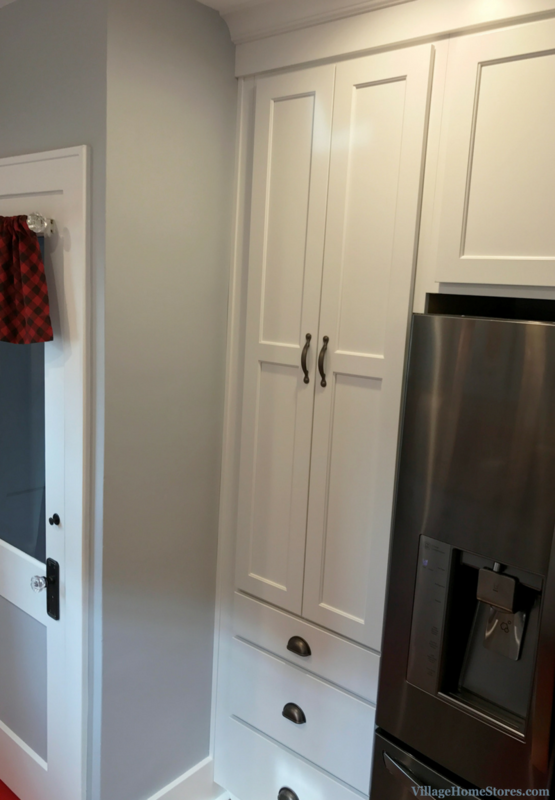 Across from the L-shape of kitchen cabinetry is a tall pantry cabinet. 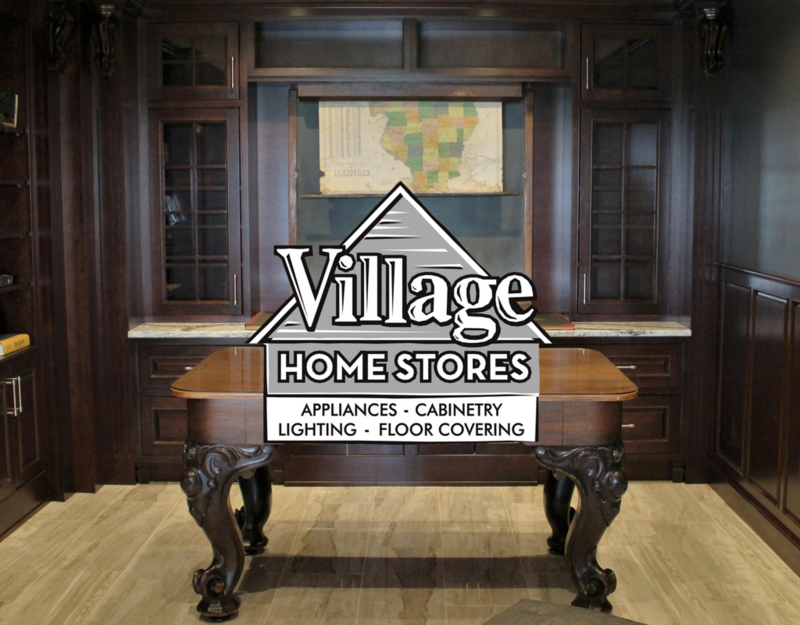 This cabinet offers 24″ depth of great storage and a stack of deep drawers below. 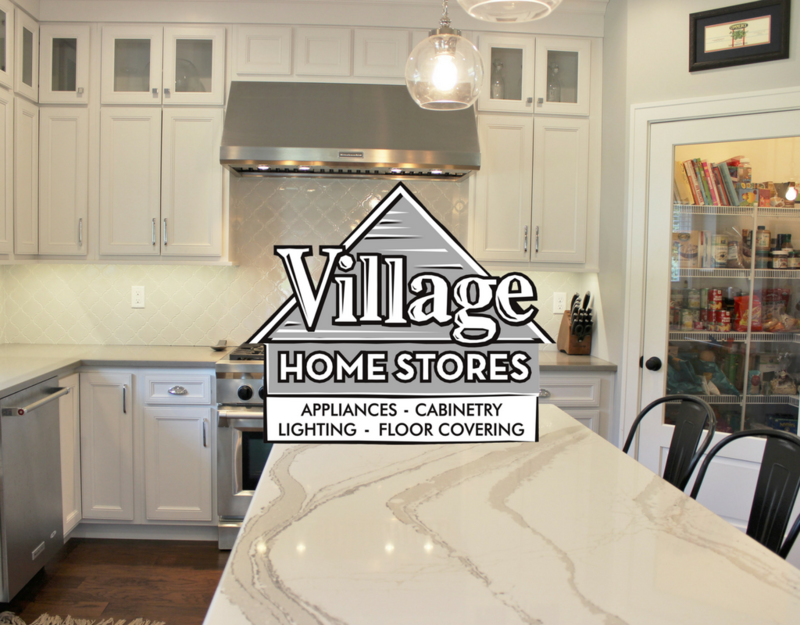 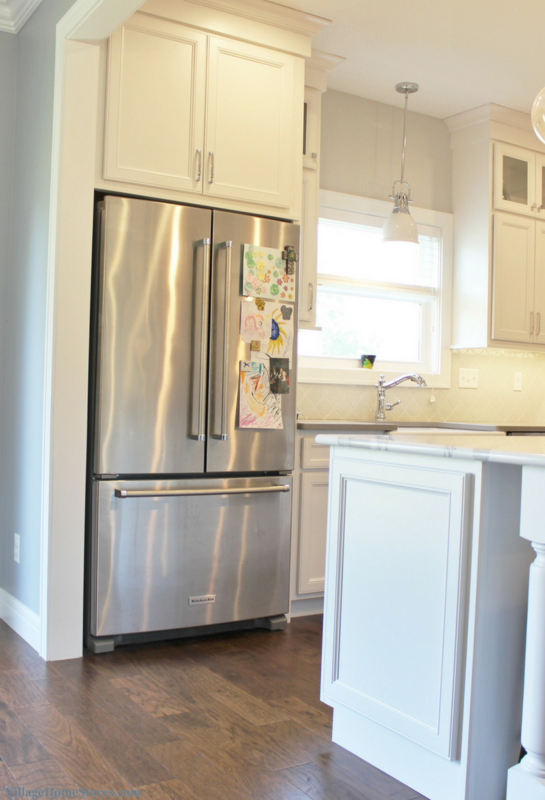 This kitchen was remodeled using the complete Project Management program at Village Home Stores. 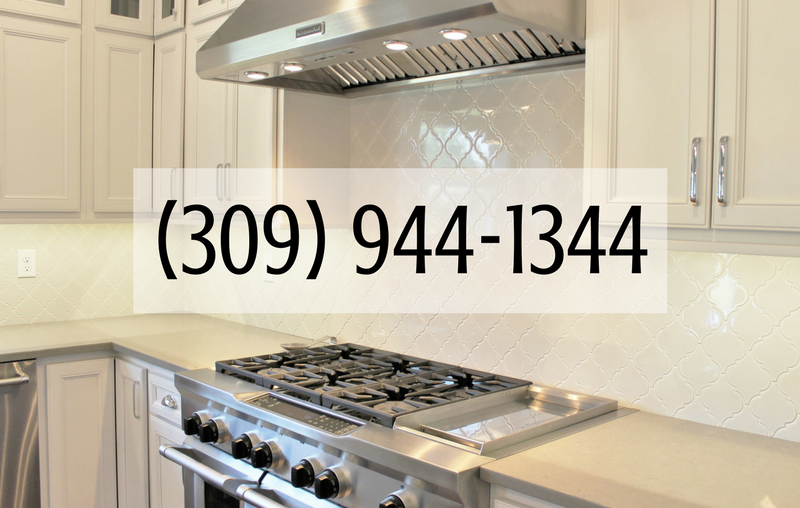 We managed it all from start to finish.Reach out to us today to learn more about our proven process for kitchen remodeling in the Quad Cities region. 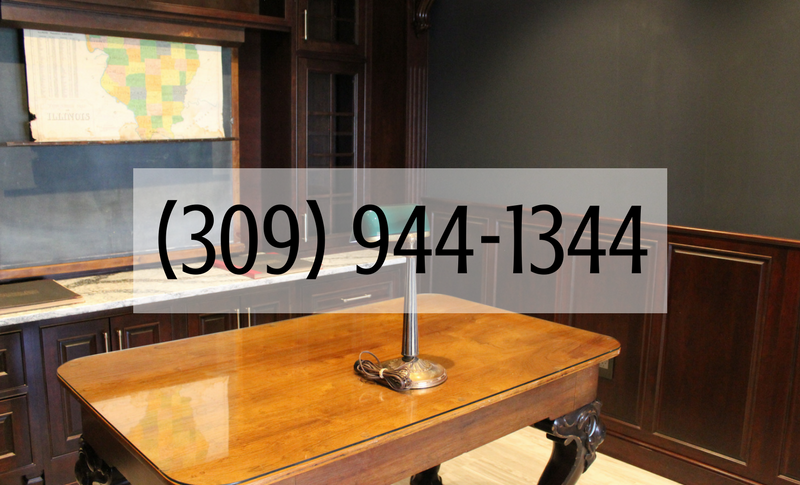 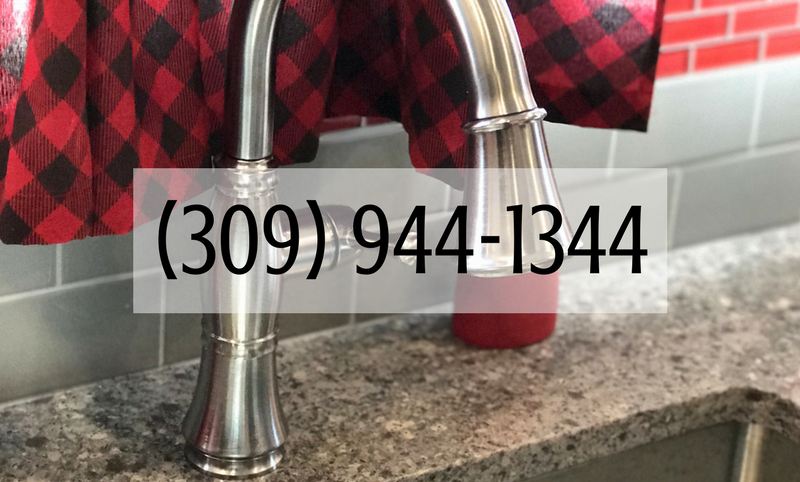 Call us at (309) 944-1344 or complete this online form and we will be in touch as soon as possible to get started.